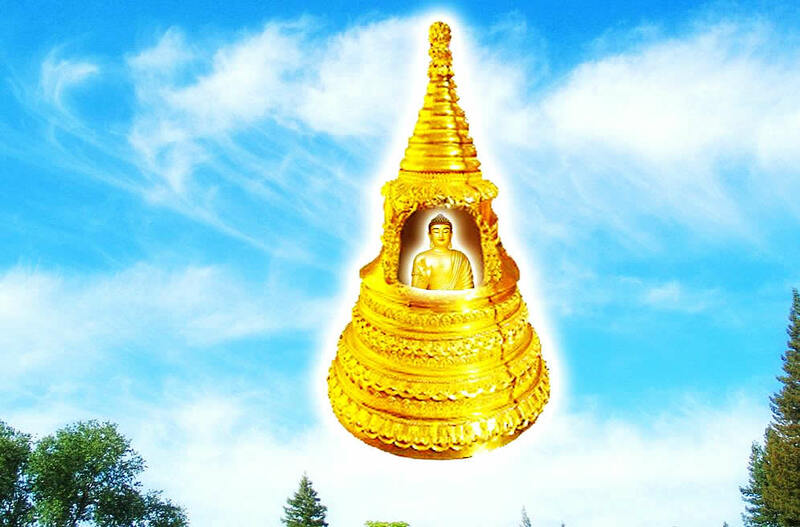 At that time, there manifested before the Buddha, a Stupa made of the seven jewels. It was five hundred yojanas in height and two hundred and fifty yojanas in breadth. It welled up out of the earth and stood in empty space, adorned with all kinds of jeweled objects. It had five thousand railings and thousands of myriads of alcoves. Countless banners and pennants adorned it as well. Jeweled beads were hung from it and myriads of millions of jeweled bells were suspended from its top. The scent of Tamalapatracandana issued from all four sides and filled the entire world. All its banners and canopies were made of the seven jewels: gold, silver, lapis lazuli, mother of pearl, carnelian, pearls and agate reaching up to the palace of the four heavenly kings. From the Heaven of the Thirty-Three there rained heavenly mandarva flowers as an offering to the jeweled Stupa. All the gods, dragons, yakshas, gandharvas, asuras, garudas, kinnaras, mahoragas, humans, non-humans and so forth, thousands of myriads of millions of them, made offerings to the jeweled Stupa of all kinds of flowers, incense, beads, banners, canopies, and instrumental music, reverently honoring it and praising it. Just then the four assemblies, seeing the great jeweled Stupa standing in mid-air and hearing the voice from within it, all gained Dharma joy and marveled at this unprecedented occurrence. They rose from their seats, reverently placed their palms together and withdrew to one side. The Buddha told the Bodhisattva Mahasattva Great Delight in Speaking: The Buddha Many Jewels has made a profound and solemn vow: “When my jeweled Stupa manifests in the presence of the Buddhas because The Dharma Flower Sutra is heard, if there is anyone who wishes me to show my body to the four assemblies, then the division body Buddhas of that Buddha who is speaking Dharma in the worlds of the ten directions, must all return and gather together in one place. Afterward, my body will appear. Great Delight in Speaking, my division body Buddhas present in the ten direction worlds speaking Dharma, should now gather together. 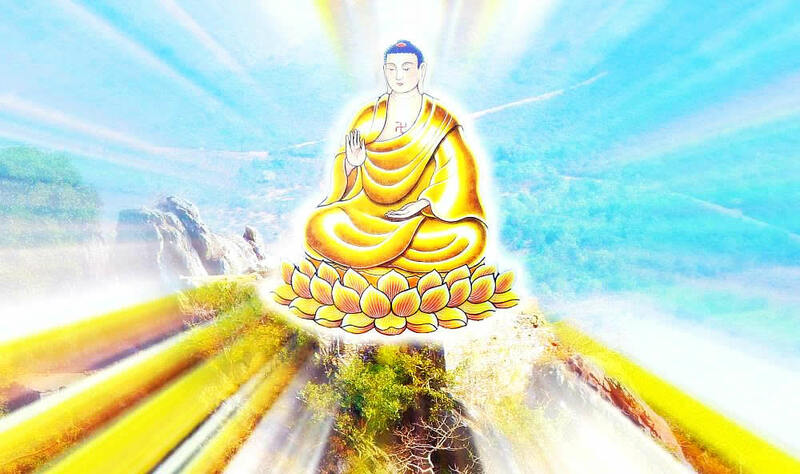 At that time the Buddha emitted a white hair-mark light in which were seen the Buddhas of the lands in the eastern direction equal in number to the grains of sand in five hundred myriads of millions of nayutas of Ganges rivers. All the Buddhalands had crystal for soil, and were adorned with jeweled trees and jeweled clothing. Countless thousands of myriad of millions of Bodhisattvas filled them. They were covered with jeweled canopies and jeweled nets. The Buddhas in those lands with a great and wonderful sound were speaking the Dharma. Also seen were limitless thousands of myriads of millions of Bodhisattvas filling those lands speaking the Dharma for the multitudes. Thus it was also in the south, west, north, the four intermediate directions, as well as upward and downward wherever the white hair-mark light shone.